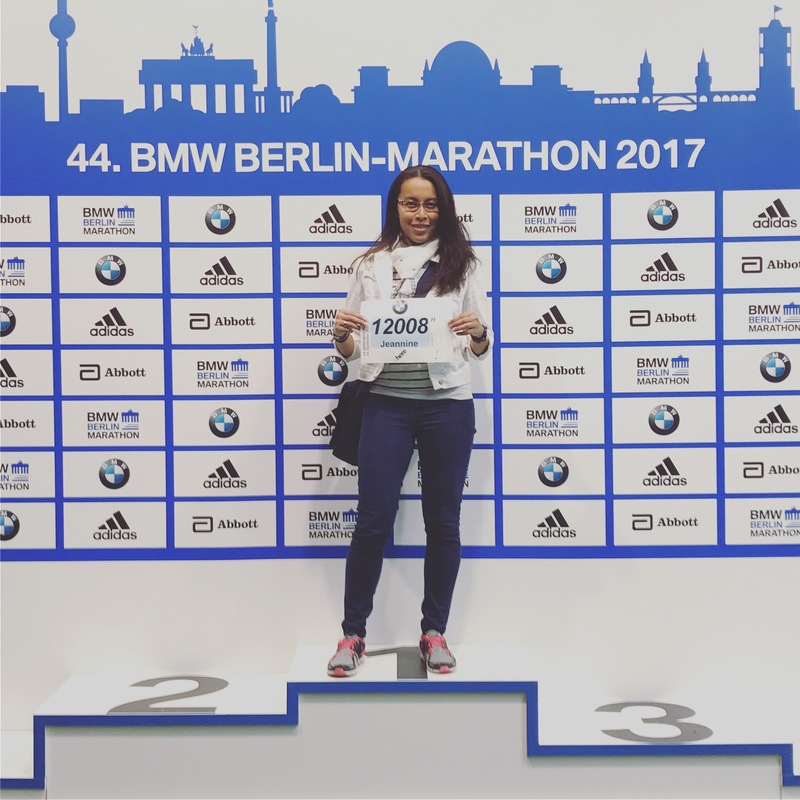 There were 3 reasons why I wanted to run the BMW Berlin Marathon: (1) it was a good reason to go back to Berlin, (2) it’s known to be flat and fast, and (3) it’s one of the Abbott World Marathon Majors. The marathon has since come and gone and I am still riding that high… but let me start from the beginning. 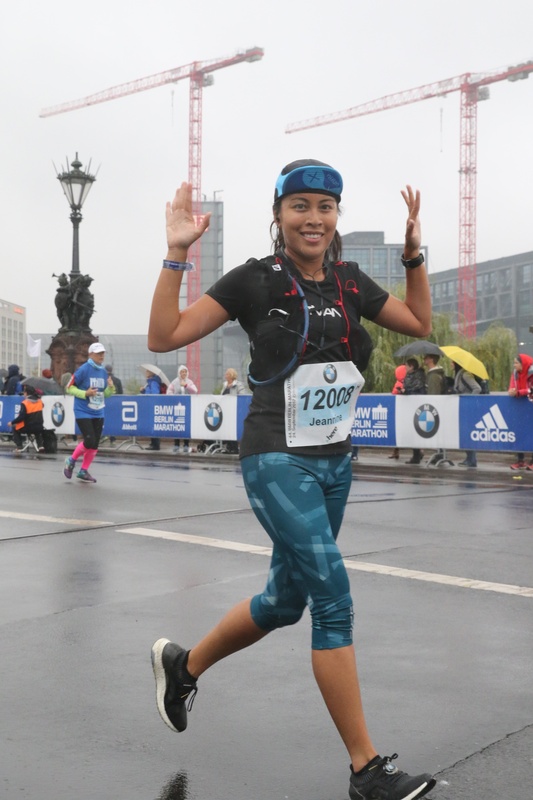 I entered the BMW Berlin Marathon lottery in 2015 hoping to get in for 2016. My name wasn’t drawn. I entered the lottery in 2016 for 2017, thinking maybe this is the year… nope. Luckily, sometime after the draw, a batch of entries was released at a higher price. The entry was €108 plus a mandatory €60 donation to their charity. I decided to go for it since I didn’t want to leave it to fate again. As soon as the window opened, I pounced on the ticket and managed to register without a problem. When I received the confirmation, a huge weight lifted off my shoulders. It was time to get serious! Just a heads up, you won’t just be paying for the entry, you have to pay for the timing chip rental too. Finisher and event shirts are also not included in the entry. They were €30 each, but I bought them anyway. You also had the option to buy on-site medal engraving, poncho, as well as Adidas shoes. That is what I regret not buying… the shoe design wasn’t shown so I opted not to spend a lot more money on a mystery item. You’ll see the shoes later on in my review. So after totaling everything, this was the most expensive marathon I’ve ever signed up for at €241.02. For me, it was worth it. Following my PB at the BMO Vancouver Marathon, I restarted the Hal Higdon Intermediate 1 marathon training program. It worked well for BMO, even when I didn’t follow it to a tee. This time around, I followed it as closely as I could and it seemed to work wonders. 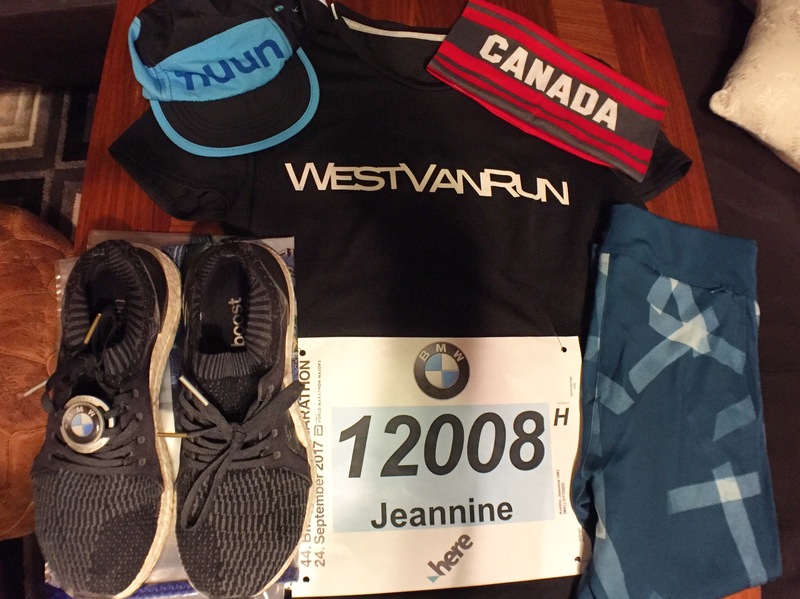 I also tried to get up the Grouse Grind and BCMC as often as I could, in addition to competing in trail races and other road racing events to keep me on my toes. The Hal Higdon program was tough and required a lot of hours on the road, but I definitely recommend it if you can spare the time. I was running about 40-60 km per week. 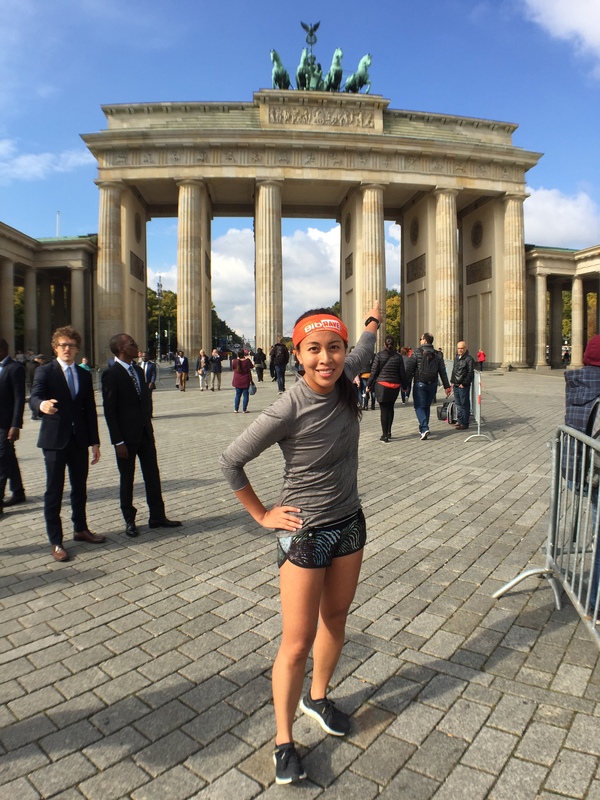 A taper run in Berlin, the Brandenburg Gate is behind me. By total chance, our Airbnb in Berlin happened to be a 5 minute walk to the expo. For those who are staying further, the expo was very easy to get to because it’s right next to the Gleisdreieck U-Bahn station (accessible via the U1/U2 lines). We arrived on Thursday, which also happened to be the first day of the expo. If you’re in Berlin early enough, consider visiting the expo on the very first day. We kept walking by the expo the next two days and it was a madhouse. 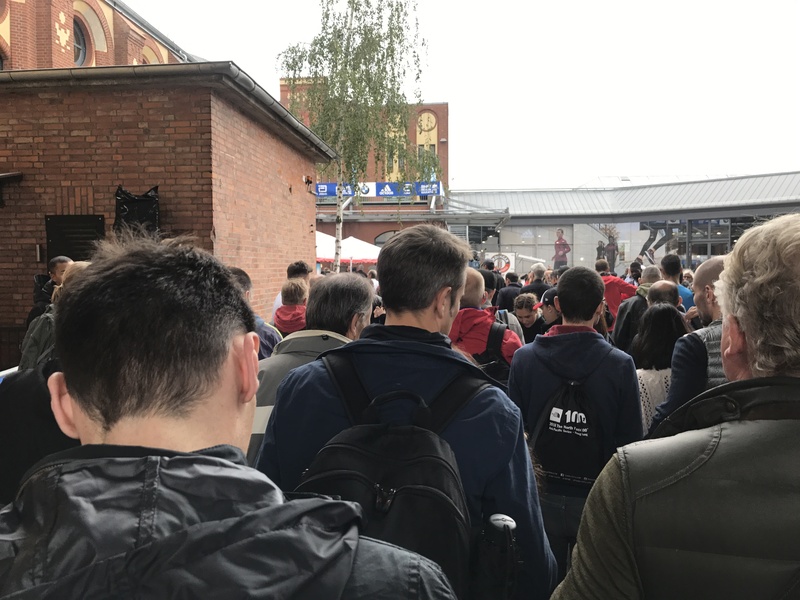 After we dropped our bags off, we went for a run, relaxed, and made our way to the expo at Station Berlin, a former railway station that is now used as an events and conference centre. We arrived minutes before it opened but there was already a long lineup. 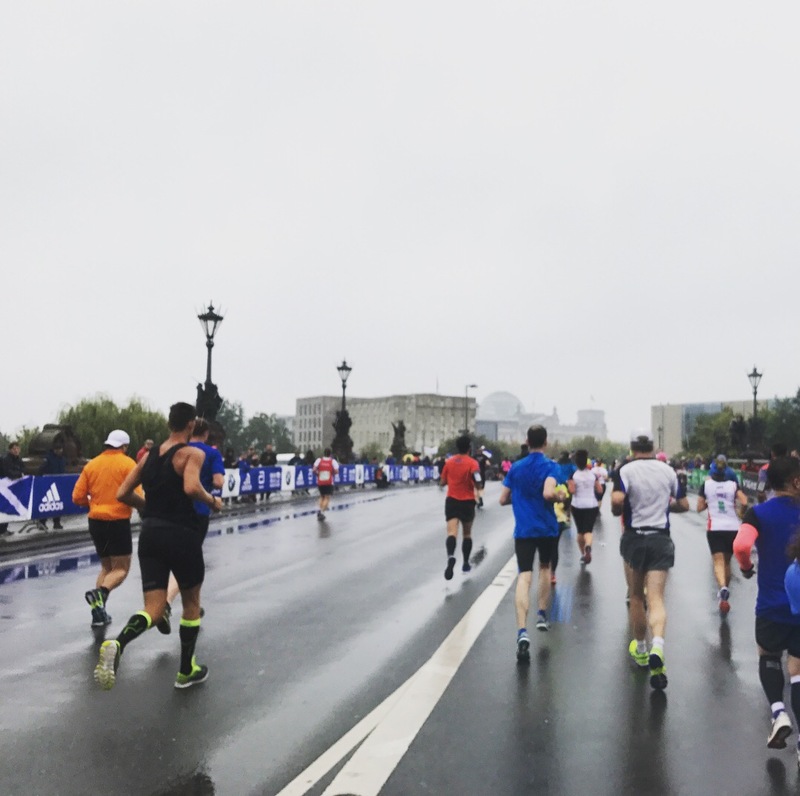 Spectators and runners had different entrances so make sure you have a meeting place set up or a way to contact each other inside… the expo is HUGE! Getting my package was very easy and efficient (which is what I expected). Don’t forget to bring your passport and your start card, which should’ve been sent to your email. You’re then led into a hall to the first short lineup where they put on your event bracelet. That lets volunteers know that you are a participant. It’s not a paper bracelet, it’s a fabric bracelet that is sealed on your wrist, for that custom fit. The room is lined with counters with people waiting to help you so you don’t have to line up in the first section… you can just keep walking until you see a counter with a shorter lineup. It was very quick. I received my bib, timing chip and goodie bag. One tip, don’t forget to grab safety pins. Once you leave the package pickup area, you have to go all the way out, line up and get your passport checked again before re-entering. I forgot safety pins and had to do just that. 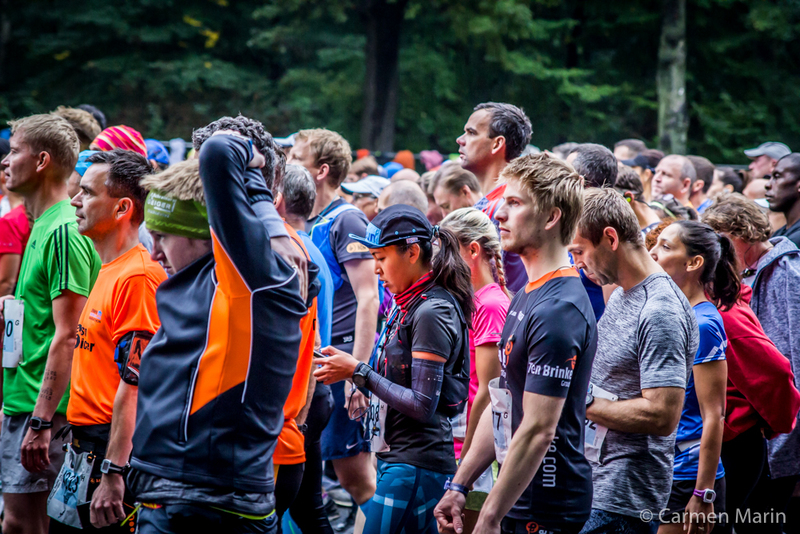 Your bib has tear-away receipts of the items you’ve pre-purchased such as your finisher and event shirts. It was so easy, all you had to do was find the counter with the shirts, they tore it off and gave you what you need. 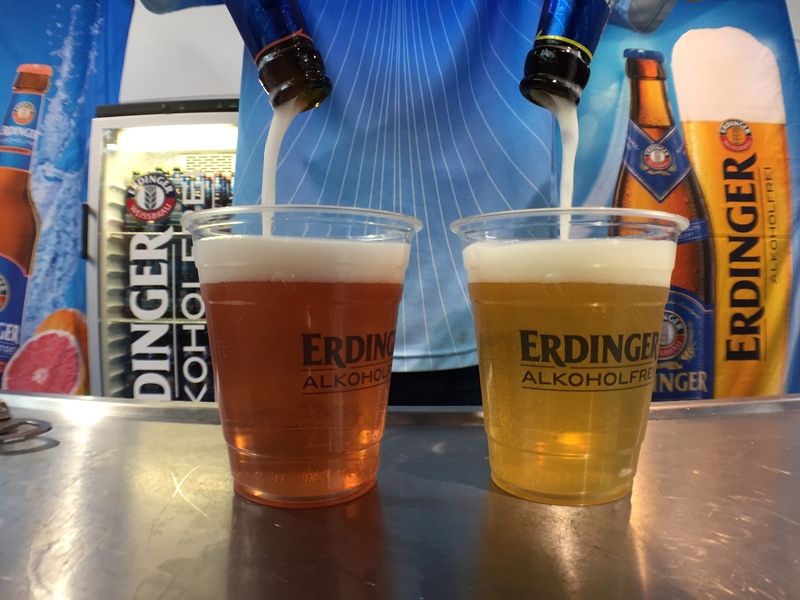 It also has some tear-away receipts for things that you will receive post-race like the snack bag and a free Erdinger Alkohol-frei Bier. I don’t understand why they were giving out alcohol-free beer in Germany of all places. Do they not know it’s a good recovery drink? LOL Anyway… at least it tasted good. The expo amassed many rooms. It was overwhelming. Adidas and BMW are the title sponsors so they were right smack in the middle. The Adidas store was large and sold all the official event merchandise and more. 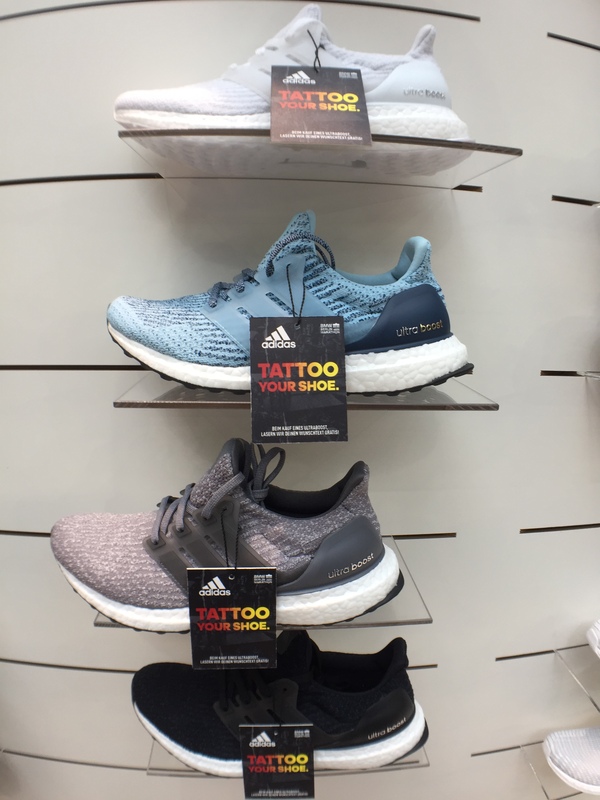 I was contemplating buying UltraBoosts that you could put your name on (Tattoo Your Shoe) but I decided not to. There were other styles with a 10% discount too but the exchange rate just doesn’t make it worth it. The event shoes are beautiful… I wish I bought them anyway. I ended up leaving with some tights (thanks Cuski) and the official jacket. It ended up costing me $120 CDN. Ouch. Take your time and go through the booths. There were so many brands and a lot of them aren’t available in North America. I loved the On Running display, as you can see here. They look like reflections but they’re just shoes hanging upside down. 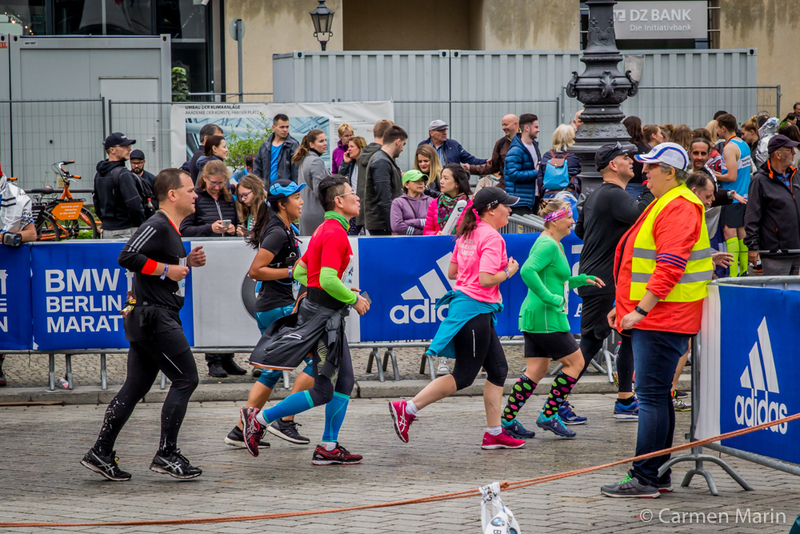 Keep walking and you’ll also see booths with shoes and apparel on sale, as well as booths showcasing European races so you can plan your next destination racecation. 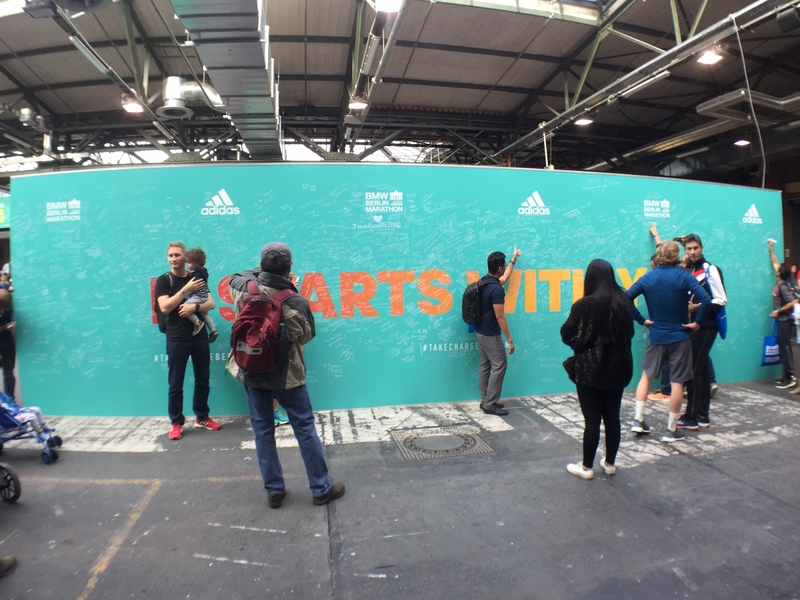 I also left my mark on the big green wall that says “It Starts With You.” I never thought I’d be running a marathon and here I was about to run my third… and it all started with me just giving running a chance. I loved being able to share this passion with so many people from around the world, who came together for this one event. It brings everyone closer together. The busiest booth was this one… the BMW engraving booth. They handed out a limited number of personalized key chains. You had to drop off your form with your name & bib number on it, wait 45-60 minutes and then come back and pick it up. Pick-up was very inefficient, which was weird. People held out their numbers and the clerks checked their pile of envelopes to see if it was ready or not. Lots, including myself, waited for a long time before getting it. People want their free engraved keychains! This is the engraved keychain everybody wanted. Outside, there were food carts and the fleet of BMW pace cars. We enjoyed a little snack here before we left to enjoy a relaxing evening at home. I LOVED THIS EVENT AND GUESS WHAT, IT’S FREE! 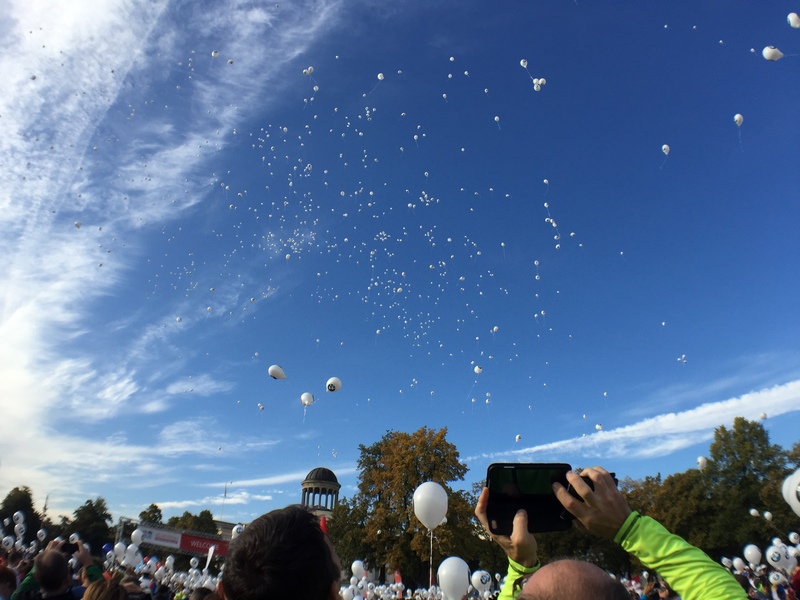 It’s a 6 km run from Schloss Charlottenburg to Olympiastadion and it was your chance to show some patriotism. Thousands of people showed up at the castle to enjoy a relaxing jog. Cuski and I ran, chatted, and took photos, as did many others. Everybody had smiles on their faces and many wore costumes. The excitement was infectious. It was a perfect sunny day for a run through the streets of Berlin and the icing on the cake was finishing on the track of the Olympic Stadium. Unfortunately, with the sheer amount of people, our victory lap around the track was more of a walk but it was still impressive. Breakfast was served afterwards, but I felt that this was poorly executed. They should’ve just pre-packaged boxes for everyone. Instead, it was a free-for-all and it didn’t help that greedy people at the front were grabbing multiples of each item for themselves and stuffing them in tote bags. To get home, there is an U-Bahn station right next to the stadium but I hope you’re not claustrophobic (see photo below). I mapped the Breakfast Run route on RunGo – you can check it out here. I met Jessica from BibRave! Took the U-Bahn home… omg… like a can of sardines. Two days before race day, I caught a cold. On Friday evening, my throat started hurting. On Saturday, my throat still hurt and some sniffles came. Race morning, I felt fatigued, popped two aspirin and hoped for the best. One good thing about an Airbnb is having the ability to cook. I made myself oatmeal like I usually do before a race and prepped my Nuun Performance. 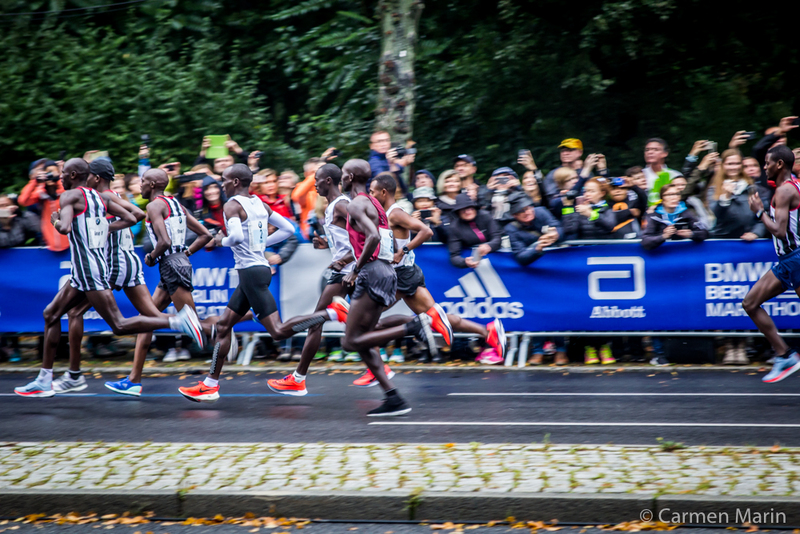 We took the U-Bahn to Potsdamer Platz and followed the runners into Tiergarten. Friendly volunteers directed us to the right way. I was wondering if we were going the right way since we’d been walking for 20 minutes. Eventually we made it and, by chance, we saw the elites start. They’re so graceful and fast. It was time to say goodbye and head into the corrals. My start wasn’t until 10 AM but I managed to get into an earlier wave. Nobody was checking. It was a good idea since I knew it would take me over 5 hours to complete… Might as well start earlier. I felt strong up until the 15th km when I started feeling feverish. It rained lightly and was humid so I stayed cold and wet for the whole race. I was miserable but what kept my spirits up was the people. There were very nice runners who took random selfies with me and others who would give encouragement to random strangers. 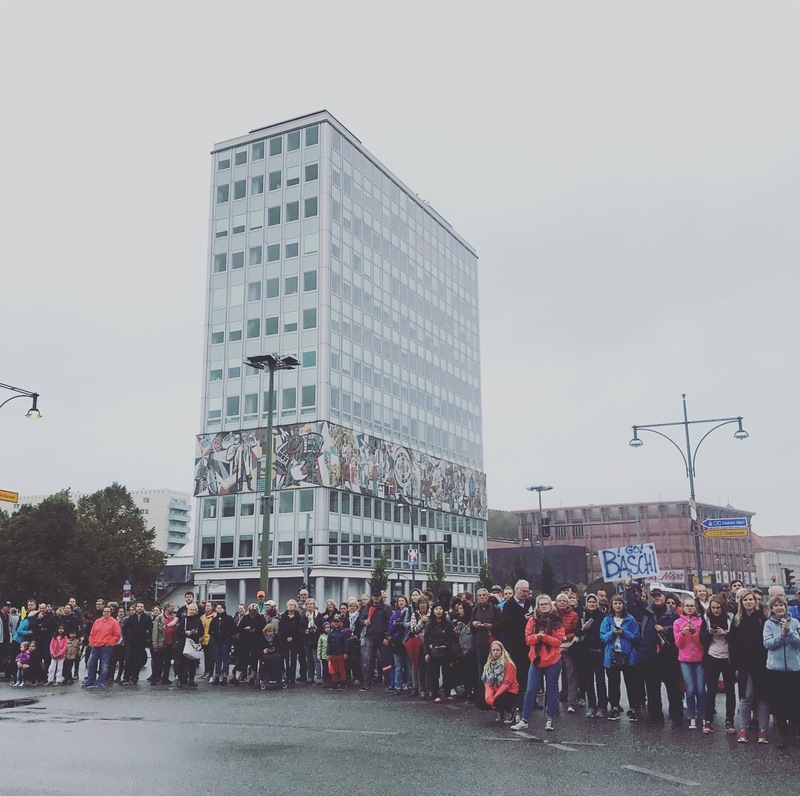 What surprised me the most was the sheer amount of spectators. There was so much live music and excitement throughout the course and not much of a lull. I saw a lot of flags, heard a lot of cheers, even local businesses set up speakers and played music (I remember seeing a DJ). There were even people set up on the sidewalk handing out bread sticks and other snacks. As a runner, I felt really special. Running over the Spree with the Bundestag in the distance. This caterpillar passed so many people. They won a world record for fastest marathon in a 4-person costume. Most importantly, the route was beautiful and flat. I love Berlin already but I think I love Berlin more now that I’ve seen the different neighbourhoods. It’s so green, clean, and easily accessible. I saw so many U-Bahn stations along the way. I knew that Cuski was going to try to spot me along the course. By the halfway mark, I still hadn’t seen him, which was discouraging. There was also a lot of people hanging out so seeing a specific person in a crowd was next to impossible. I just powered on as much as I could, eating bananas and getting fresh water at the many aid stations I passed. By about the 36th km, there was a Red Bull and water station. You have no idea how happy I was to have this fuel. The 37th km was near our Airbnb so if I were to see Cuski, it would be there. Thankfully he was there and that brought my spirits up. He ran and chatted with me for a bit but after that, since there was less than 5 km to go, I motored. In my head, I chanted, “it doesn’t hurt.” It seemed to work, as I maintained a pretty decent pace after having run for 5 hours already. 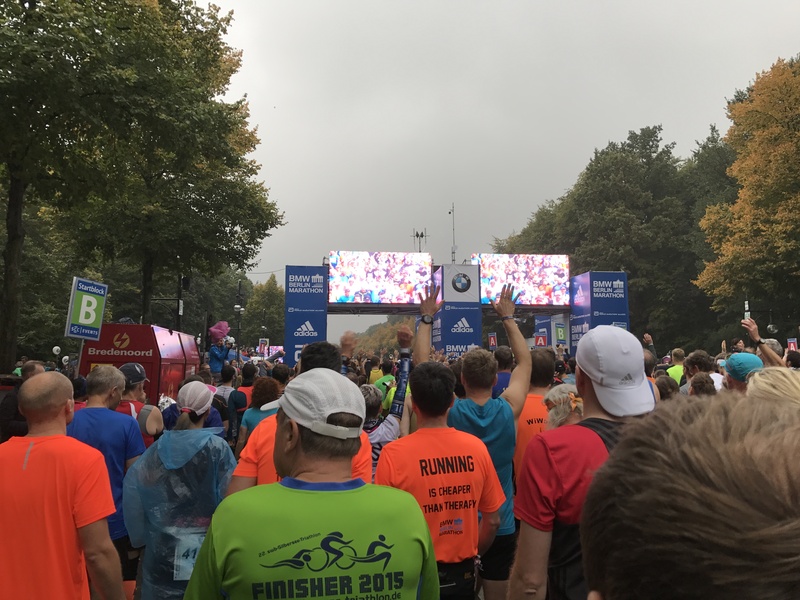 Seeing the familiar Potsdamer Platz was a great feeling, until I realized there was still about 3 km left and we were running AWAY from Tiergarten (the finish). After a few winding turns, we finally headed towards the finish. 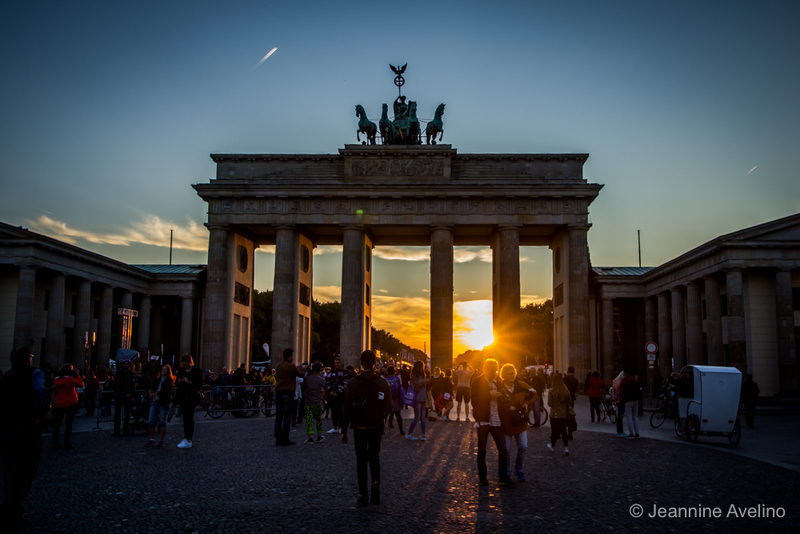 Seeing the Brandenburg Gate ahead of me was such a great relief. I mustered whatever energy I could and bolted for the gate. 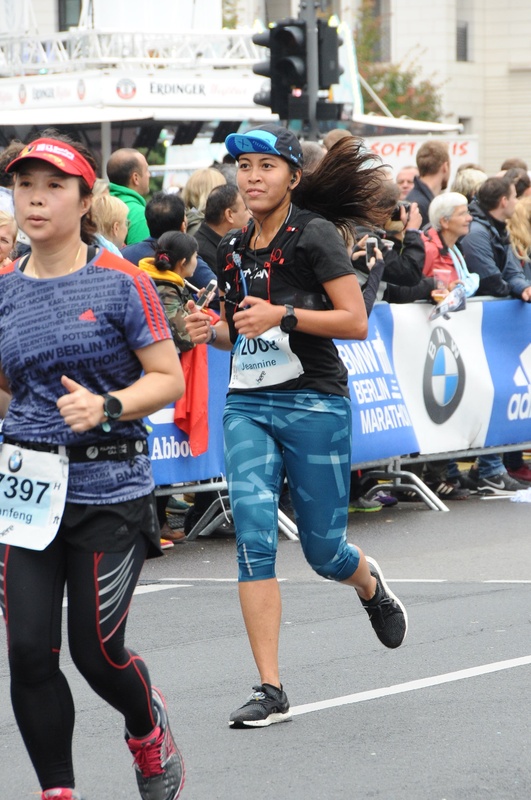 I knew the finish was a few hundred meters after the gate but the adrenaline took over and I managed to finish stronger than I felt. Despite my cold, I pulled off a time of 5:29:11, a 3 minute improvement from the BMO Vancouver Marathon. I’m just so happy to be under 5:30. Next goal: 5:15! 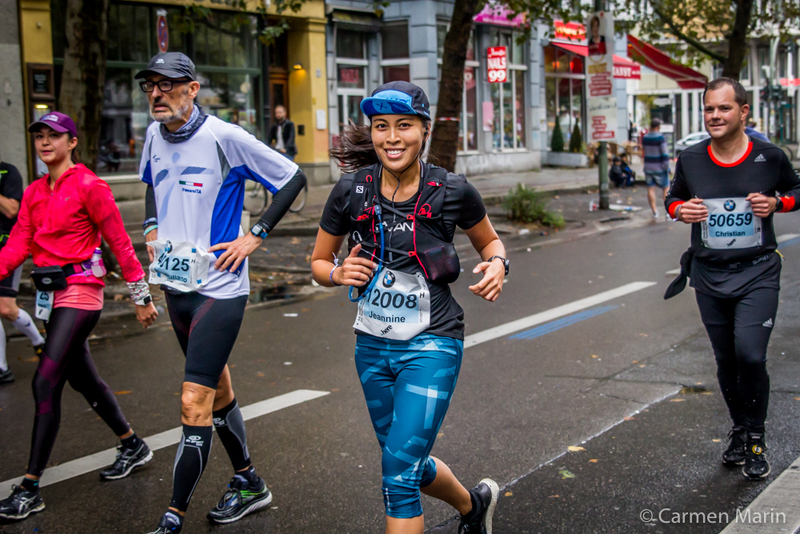 If you’re in Berlin and want to run the course, you can find the RunGo route here. Find out more about using RunGo here. I made my way down the chute and first things first, I grabbed my medal. It’s a beautiful medal that showcases the Brandenburg Gate and behind it is an image of South Africa’s first black Olympic medallist, Josia Thugwane. The lanyard is of course a German flag. I then grabbed my bag of post-race snacks which included a banana, some packaged bars/croissants, and an apple. There were a bunch of MarathonFoto photographers waiting to capture your finest moment all around the area. Of course I got some photos taken (which I then paid an arm and a leg for). 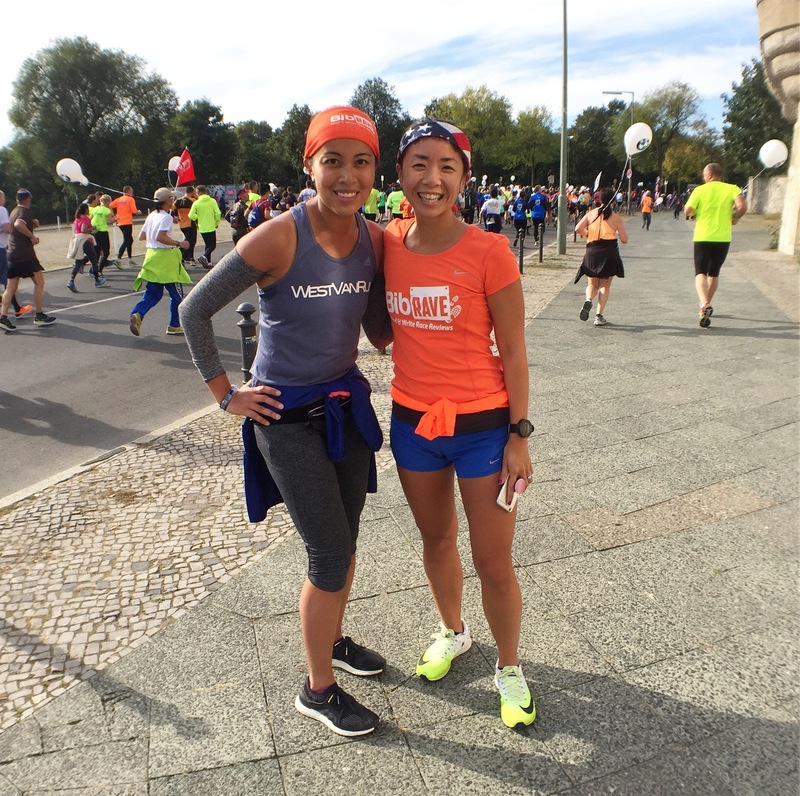 The lawn of the Bundestag was where runners could congregate, take selfies and just relax a bit before leaving the area. Friends and family weren’t allowed in the runners’ area, you’d have to get out to meet them. On the way out, don’t forget to return your timing chip otherwise you will be dinged for it. I didn’t buy engraving for the medal, which was a good thing. The line was really long and you had to do it right there and then. You’d have to wait and come back for it, too. I went straight to the meeting point. There were lots of food stands set up by the Brandenburg Gate, where I met Cuski and our friends. I was so glad to see them and to be done. I just realized I didn’t take a photo of us… I’m blaming it on fatigue lol! 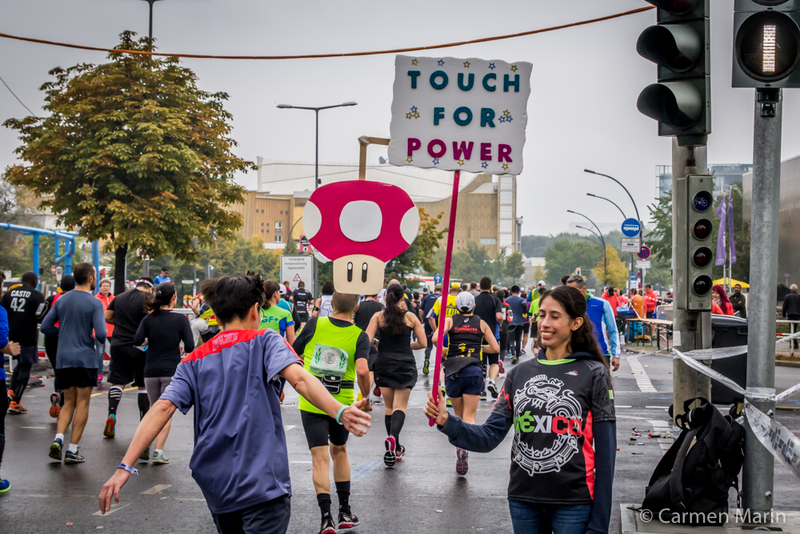 To see the full gallery of his AWESOME Berlin Marathon photos, click here. Organization – The Germans are very organized and it shows. It’s easy to figure out where to get what you need. Communication was great and lots of information was available online and at package pickup (they handed out information booklets and transit maps). All my questions were answered quickly just by looking online or reading the booklet. The race started promptly and there were lots of signs and volunteers showing you where to go. They also gave advice on which station to get off at since there are road closures all over the place. 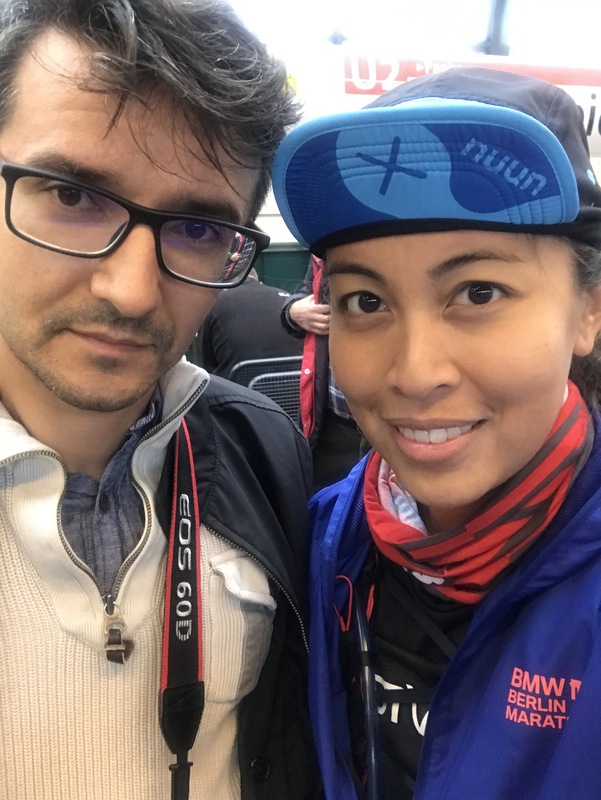 Package Pickup & Expo – I went on the first day right when it opened and it was a breeze; although, I heard that things get quite hectic closer to race day. While it was a large venue, everything is organized and easy to find and within 10 minutes, I got my package. What I didn’t like was that once you left package pickup, you can’t go back in. The Expo conveniently located by the Gleisdreieck U-Bahn station. It was large and you can take up a lot of time just walking and seeing everything. The Adidas shop is massive and they had separate lines for people buying official merchandise and those buying regular stuff. I don’t know why but I’m sure there was a reason. We bought official and non-official stuff separately and there wasn’t much of a lineup due to the number of cashiers. There’s food outside if you get hungry as well (bring cash). Course – The course is fast and flat as advertised. You run through a bunch of neighbourhoods, cross the winding Spree River 6 or 7 times, and see some iconic landmarks. 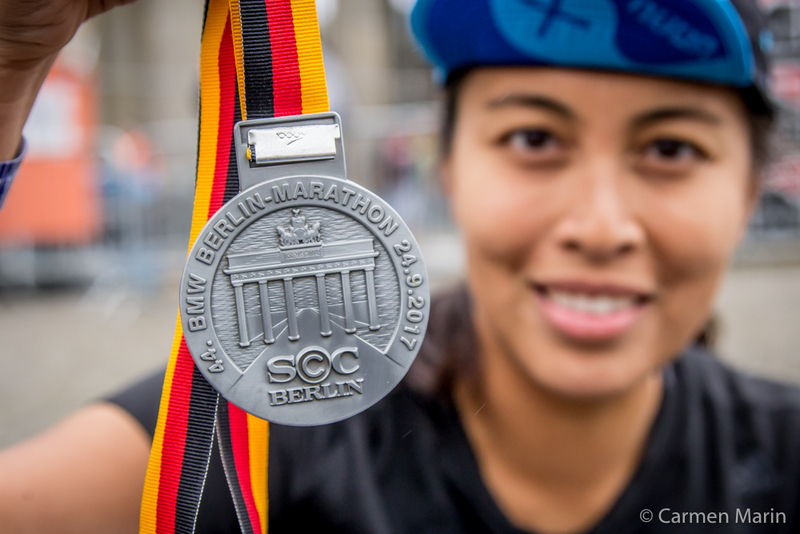 The best part was running through the Brandenburg Gate, a nice welcome to the finish line. Aid stations were plentiful and well-stocked. There was also a Red Bull station at about 6 km to go which was helpful. They did use plastic cups for water but paper cups for energy drink. I think they could’ve used paper for both, I don’t know why. It made a bit of a mess. All the volunteers were friendly and happy to help you out. There were even massage stations in the second half of the course! Swag – I don’t like that you had to pay for finisher shirts but I like that they gave you a choice to even get a shirt or not. I personally bought the shirts but I know some people would rather not have it. I guess I could count the Breakfast Run as swag… it was a free event with free food. That, I appreciated, as it was a fantastic shakeout run. The medal is beautiful and the post-race snack bag I got had a lot of stuff in it. Again, I wish I bought the shoes. Would I Do it Again? In a heartbeat. I know I could do better if I wasn’t feeling like crap. 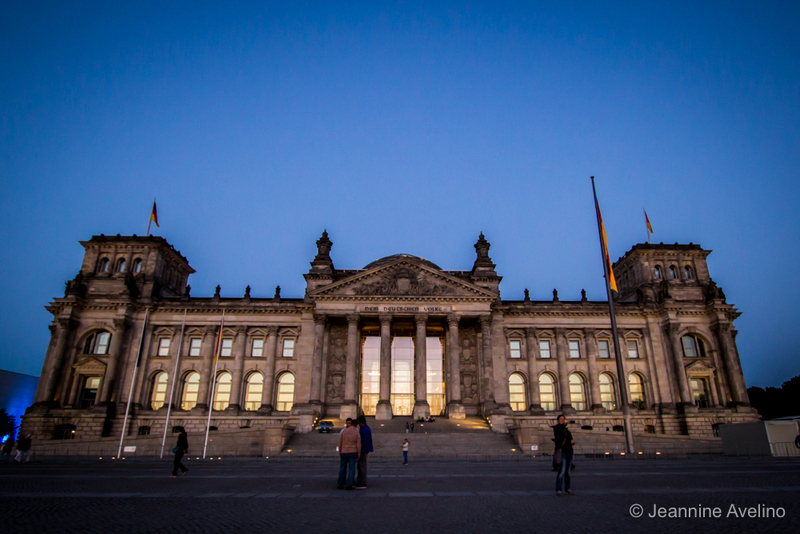 Plus, I love Berlin. Danke für alles, Berlin. Auf Wiedersehen! Thanks for sharing! 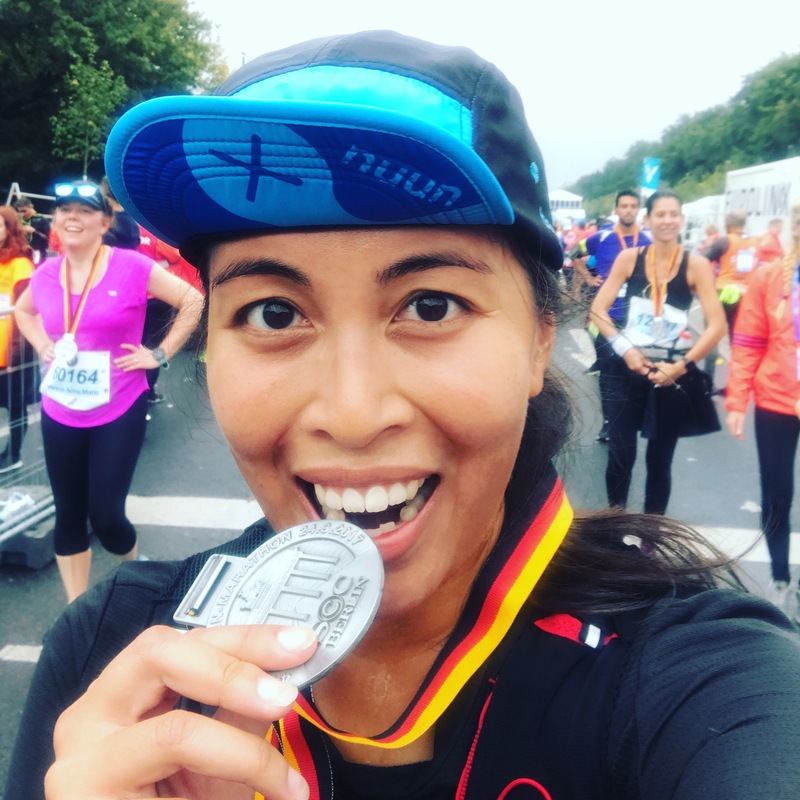 I’m running Berlin this September and am starting to get excited! One question i have after watching a couple of videos.. 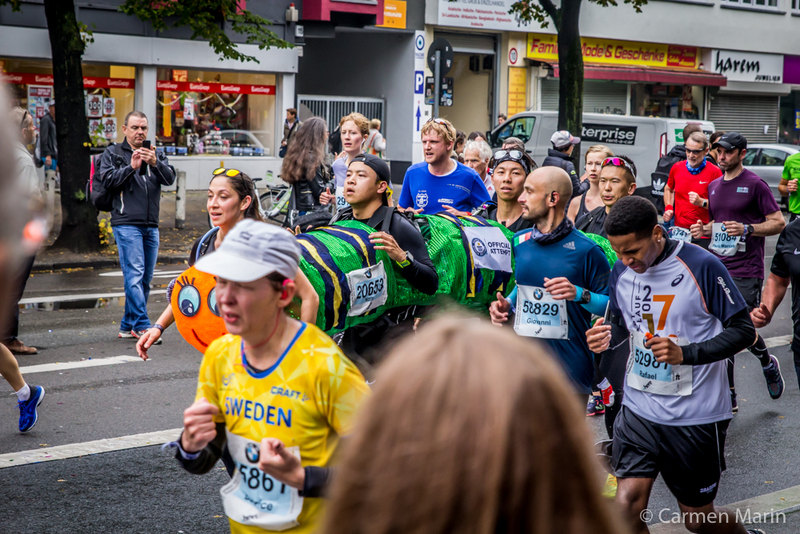 The part at the end right before Brandenburg Gate – did you guys run on a cobblestone road? I have a wobbly ankle 🙁 Was in a race last month where we had to run over 2 patches of cobblestones and it was truly torture. Hi Mei! I’m excited for you for Berlin, you’re going to have a great time! I don’t think there are cobblestones after the gate, it’s a main road. I don’t remember much cobblestones in this race actually but it is Europe, so expect a few and just be careful 🙂 Good luck! Soles of Bangalore, India !